— Legislative Attacks on NEPA and Other Laws Important to Pipelines – Defeating Shale Gas Infrastructure: Strategies & Tools for Communities, with Raul Garcia of Earthjustice and Stephen Schima of Save Our Environment. Join us for an update on the latest attacks and efforts to stop them! In the fight against pipelines, compressors and LNG export facilities, The National Environmental Policy Act (NEPA) is one of the primary mechanisms communities can use to fully understand and vet the impacts of an infrastructure proposal and to make the case that a project should not be approved by the powerful agency that is FERC. Learn more about the value and threats to NEPA and other attacks on the pipeline permitting process and what you can do to protect it from rollbacks. — Nonviolent Direct Action Training at Aurora. This brief workshop offers an introduction to the history of Nonviolent Direct Action and its implementation as well as examples of intersectionality within our community/movements, affinity groups and their formation, consensus decision making, and a discussion on self-care and community care. — What You Can Do Now – Activist Training. In the age of Trump, what we do at the state, regional and local level is more important than ever. Massachusetts is continuing to be a clean energy leader. Please join Massachusetts Sierra Club Cape Cod & Islands (CCI) Group for an activist training at the Brewster Ladies Library on July 19th. Presentations by Emily Norton, our Massachusetts Chapter Director, and Chris Powicki, member of the CCI Group’s Executive Committee will bring you up to speed on key state level clean energy bills under consideration on Beacon Hill, as well as opportunities for local and regional action, and give you the tools you need to effectively advocate to your elected officials. — Public Prayer Circle. People of all faiths, and people with faith in the power of community are invited to join local faith leaders at the site of the proposed Enbridge compressor stations on summer Wednesdays at 6:00 for a brief prayer circle. You are welcome to bring a prayer, poem, or song from your tradition to share, or you may wish to pray or meditate in silence. Family friendly. THURSDAY — JULY 20, 2017 — EVERYWHERE! — Non-Violent Direct Action Training. Considering participating an an action that could involve risking arrest? Interested in finding out about Sugar Shack Alliance and possibly joining an Affinity Group so that you could participate with us in an action that could involve arrest? Interested in deepening your understanding of what non-violence is and what makes an effective action? Interested in examining how privilege intersects with the decision to offer oneself for arrest? Interested in learning about consensus decision making and quick decision making? — Mass Energy’s 7th Annual Clean Energy Festival! Join Mass Energy, People’s Power & Light, and the Center for EcoTechnology for our annual adventures including: a wind turbine tour, solar array tour, discounted zip-lining and rides on the Mountain Coaster at Berkshire East Mountain Resort! Our mission is to make energy more affordable and sustainable. We offer a green power program that supports the wind turbine at Berkshire East. Tickets are $10 per person and kids under 8 are free. – Check out electric vehicles! – Learn about our newest clean energy program, Mass Solar Connect! – Ride the chairlift up a scenic mountainside (or, we’ll shuttle you up to see the turbine)! – Enjoy catered lunch at the base of Berkshire East’s wind turbine! – Get up-close to the wind turbine and a large solar array! – Ride the exciting Mountain Coaster! – $20 discount on zip-lining! Contact anna@massenergy.org or 800-287-3950 x5 with questions! — What You Can Do Now – Activist Training. In the age of Trump, what we do at the state and local level is more important than ever. Massachusetts is continuing to be a clean energy leader. Presented by Massachusetts Sierra Club alongside Clean Water Action, please join us for an activist training in Plymouth on Monday, July 24th. Presentations by Emily Norton of Sierra Club and Joel Wool of Clean Water Action will bring you up to speed on key state level clean energy bills under consideration on Beacon Hill, and give you the tools you need to effectively advocate to your elected officials. — NY PSC National Grid Public Hearing. The New York Public Service Commission (PSC) will determine whether the company’s request for a rate hike is reasonable.The PSC will make this decision as part of a rate case that is happening right now. In the rate case, the company has filed a proposal for the rate increases and an explanation for how it will spend the money it receives from customers. Organizations and individuals have the right to intervene in this case and challenge the company’s plans. At a time when tens of thousands of customers already cannot pay their bills and the future of our ecosystems depends on reducing greenhouse gases, we cannot afford to allow this rate hike to go forward. We will band together to fight for affordable bills and investments in our clean energy future, not fossil fuel infrastructure. Join us at an upcoming public hearing to make your voice heard. — Our Energy Future – Activism Presentation. Hosted by Mass Sierra Club. We all want clean air and water for our kids and grandkids.Now, more than ever, what you and I do at the state and local level is crucial because of rising sea levels, more frequent storms and crumbling infrastructure here in Massachusetts. Please join us for a briefing that will bring you up to speed on key energy bills under consideration on Beacon Hill and give you the tools you need to effectively advocate to your elected officials. » RSVP with this link! — What You Can Do Now – Activist Training. In the age of Trump, what we do at the state and local level is more important than ever. Massachusetts is continuing to be a clean energy leader. Presented by Massachusetts Sierra Club, please join us for an activist training in Melrose on Thursday, July 27th. Presentations by Emily Norton of Sierra Club and Melrose resident Eugenia Gibbons of Mass Energy Consumer’s Alliance will bring you up to speed on key state level clean energy bills under consideration on Beacon Hill, and give you the tools you need to effectively advocate to your elected officials. — Celebration for a Living Earth. Join us, The Sugar Shack Aliance, for this summer’s public rally and picnic to raise our collective concerns and awareness on the continued resistance to the Kinder Morgan/TCG CT Expansion Pipeline in the Otis State Forest! Once again, meet us at Spectacle Pond where we gathered last year for our last summer solidarity picnic! We will again feature musical guests and speakers from across the movement and from all corners of the northeast! That’s from 10am to noon! Then, at 12:30pm, a potluck picnic lunch at 12:30pm, followed by an informal gathering of musicians improvising together at our staging area at just north of the pond at Sue Baxter’s Barn, 250 Cold Spring Rd. Free, Family-friendly and open to the public! — Street Medic Bridge Training. This training is open only to those who have previous or current medical certifications (EMTs, Paramedics, Nurses, Nurse Practitioners, Physicians, 3rd & 4th year Medical Students, Wilderness First Responders.) It is assumed that you have experience with major medical issues as well as trauma management. Street Medics provide first aid at political protests including marches, occupations encampments, direct actions and more. This is the standard training for folks of any experience levels who wish to identify themselves as Street Medics while providing care. Participants are expected to attend the full 4 hours of the training and to come prepared to participate in the hands on components. Please dress for the weather and bring a pack with everything you would want with you for a full day at a protest this time of year. Let us know if any of this will be a problem so we can plan accordingly. • FANG is looking for donations of herbs and remedies for their street medics. Contact Zoe for more information. — What You Can Do Now – Activist Training. In the age of Trump, what we do at the state and local level is more important than ever. Massachusetts is continuing to be a clean energy leader. Presentation by Emily Norton of Sierra Club will bring you up to speed on key state level clean energy bills under consideration on Beacon Hill, and give you the tools you need to effectively advocate to your elected officials. — Eversource Rate Hike Hearing. It’s back! Eversource has revised a rate case proposal, so there are additional public hearings. The proposal is still bad, but in general the revision makes it slightly less bad for Western MA and a bit worse for Eastern MA (you can read a summarized list of changes here – note that, among other things, you will see charges for low-income customers increase in some regions and decrease in others). To be clear, the fact they are trying a Plan B is the result of overall discontent and people speaking up from various sectors and regions. — North County Green Drinks! ”How Bad Is It?” — What are the indignities—and positives—the environment has suffered over the last seven months? This is also an opportunity for folks to share what “green” things we all are working on in the coming months. Presenter: Doug Harris, Preservationist for Ceremonial Landscapes & A Deputy Tribal Historic Preservation Officer for the Narragansett Indian Tribal Historic Preservation Office (NITHPO). Doug Harris will present a history of Ceremonial Stone Landscape Features in the Northeast region and the struggle to preserve them. The hills and valleys of New England are dotted with living prayers of stone (Ceremonial Stone Landscapes) created by the Indigenous peoples of this region. These stone structures were built to create and restore harmony between human beings and Mother Earth. The prayers that they embody continue to live as long as the stones are kept intact. Over 1/3 of the 73 features identified in Sandisfield have been desecrated by the construction of a new gas pipeline. This occurred because FERC approved the project before the stone features were identified, and then failed to consult with the tribes in a meaningful manner to resolve the adverse impacts. While harm has been done, this is also an opportunity to support the Indigenous peoples of our region so they can challenge FERC’s behavior in the courts. If successful, ceremonial stone landscapes will be preserved, not destroyed; a result that would have national implications. Please enter on the Center Street side of the building. Even if you cannot attend, please consider making a contribution for legal costs of this fight. You can make a tax deductible contribution online. — DOER Biomass regulations-New Hearing. Massachusetts Department of Energy is proposing regulations that allow our money to pay for industrial-scale wood burning . The implications, and potential impacts, of these proposed regulations is deeply concerning from a public health, the climate crisis, environmental justice, and forest sustainability perspective. We asked DOER for a Western Massachusetts hearing and a comment deadline extension. They added this hearing. We expect the forest industry to show up to defend their business interests, will you attend and speak up for the climate, our forests and future generations? — Rally in Albany Tell Cuomo Deny 401 WQC for CPV Natural Gas Power Plant and be a Climate Leader. We will be rallying in Albany to pressure Governnor Cuomo to do the right thing and be a climate leader – DENY the 401 Water Quality permit for the Millennium Valley Lateral Pipeline and Eastern System Upgrade. We are demanding that he shut down CPV once and for all. » Sign the petition – whether you can make it or not! Gibbons will speak about the history and status of clean energy programs and legislation in Massachusetts. Linsky will follow with a presentation about how to effectively communicate with our local officials. Both the Massachusetts Sierra Club and Mass Energy advocate for renewable energy solutions at state and local levels. Together, the organizations are well positioned to explain the ins and outs of Massachusetts energy policy, including the content and status of current bills as well steps that could be taken to improve those bills. This event is designed to get participants up to speed quickly and equip them to effect real change in their communities and our state. This event is co-hosted by: 350MA-Berkshire Node, Berkshire Environmental Action Team (BEAT), Massachusetts Sierra Club, and No Fracked Gas In Mass. — CT Draft CES Hearing – The Department of Energy and Environmental Protection (DEEP) released an updated draft of the Connecticut Comprehensive Energy Strategy (CES) July 26. Quite simply, the plan is too little, yet it is not too late to do something about it. Advocates are urging Governor Malloy and DEEP to improve the draft plan, helping the state meet its goals of reducing carbon pollution and delivering affordable and reliable clean energy to families and businesses within the state. Greater emphasis is needed on clean, renewable energy, electric vehicles, and deploying home heat pumps for heating and cooling would reduce carbon pollution contributing to climate disruption, avoid the need for new dirty energy infrastructure, save families and businesses money, all while creating jobs and building economic prosperity. We are SO excited to facilitate this workshop at Iconica, the new + groovin’ social club/juice and coffee bar in Noho. If you would like some of their organic delicious fresh cold-pressed juice, we ask for a $3-5 contribution and we will pass the hat to cover rental space although there is absolutely no obligation to donate. Peace and Love. — Peaceful Action to Protect Sacred Native Lands in Shutesbury. Join us in solidarity in a peaceful vigil to protest neo-colonialism in Shutesbury, and to honor the sovereignty and rights of native peoples everywhere. The Shutesbury Planning Board has issued a permit to Lake Street Development (based in Chicago) to build a solar farm on a suspected Native American burial ground and stone prayer grouping on Nashaway Nipmuc land. The Planning Board has refused to allow a Tribal Historic Preservation Officer (THPO) to survey the land, when in-fact the first condition of the Special Permit actually requires a THPO to review a suspected Native site. Instead they brought in an archaeologist who openly admited on record that he was not trained to identify such sites. They skipped this crucial step and issued the permit, disregarding the law. This is a peaceful vigil and rally. Bring signs, drums, prayers, your families and communities, and please help us spread the word! We will be gathering on the Shutesbury Town Common, directly across from the Town Hall. — Clean Energy Rally. The Draft Comprehensive Energy Strategy (CES) for CT has been released by the Dept. of Energy & Environmental Protection(DEEP). If Connecticut leaders are serious about climate change, the CES should be more aggressive. Please join co-sponsors 350 CT, Citizens Campaign for the Environment, Consumers for Sensible Energy, CT Fund for the Environment, and CT Sierra Club at a rally before the final CES hearing and come into the hearing to submit comments for an energy system that meets the needs of the people. — 2017 Central MA Renewable Energy Summit. Our reliance on dirty energy is polluting our communities, harming our health, and changing our climate. The good news is that we have alternatives. Cities and towns, businesses, nonprofits, and families in Central Massachusetts are reducing their energy usage and switching to clean, renewable energy from sources like solar and wind. Our recent progress on clean energy should give us confidence that we can go much further. We are inviting leaders from local and state government, businesses, institutions and community organizations to join us for a discussion about moving our region to 100 percent renewable energy, and how to maximize the benefits for our environment, our economy, and all of our residents. Lunch will be served, and we will offer a tour of renewable energy improvements at the Dismas Family Farm after the event. Food has been generously provided by Whole Foods Market. — Trial of the Century? Street Theater! This trial, set in the year 2025, brings fracked gas,inc., FOXNews, and former President Trump to trial for their crimes against humanity and the planet. The 20 minute skit sponsored by the Sugar Shack Alliance will occur every half hour starting at 9:30. — Community Rights Awareness Workshop. Post Oil Solutions (POS) is hosting a Community Rights Awareness Workshop in the Community Room at the Brattleboro Food Co-op on Sunday, September 10th, from 10 AM to 1 PM, that will be presented by the Community Environmental Legal Defense Fund (CELDF). The event is free, and light refreshments will be available. However, REGISTRATION IS REQUIRED: contact Tim Stevenson of Post Oil Solutions at info@postoilsolutions.org. Vermont residents are facing industrial wind projects, oil and gas pipelines, and water contamination from harmful corporate project. In this workshop, we examine what the systemic barriers are to Vermont residents stopping unsustainable corporate activities, and why sustainability is illegal. We take an in-depth look at how political and legal structures have been set up to protect the interests of an elite wealthy minority, at the expense of the majority of people and community self-government. We’ll look at how corporations have received more rights and protections than people living in communities. But we’ll also look at how communities have pushed back against these oppressive structures to reclaim democratic self-government in their communities, and at the state level with a proposed Community Rights Amendment. We’ll explore how communities across the U.S. are using Community Rights to challenge and change those barriers to create the sustainable communities they envision, and how citizens are joining together across states to advance democratic and environmental rights, building the next people’s movement through Community Rights.Post Oil Solutions (POS) is hosting a Community Rights Awareness Workshop at the Brattleboro Food Co-op on Sunday, September 10th, from 10 AM to 1 PM, that will be presented by the Community Environmental Legal Defense Fund (CELDF). — Extreme Events and Climate Change: What We Know & What We Can Do. Join us for a free New England Aquarium lecture featuring Ellen Marie Douglas, PE, Ph.D., Associate Professor of Hydrology, School for the Environment, University of Massachusetts Boston. In this presentation, Ellen Marie Douglas will discuss observations of our changing climate, what changes may be in Boston’s future, and some plans for how to adapt to these changes. This lecture is co-hosted by the League of Women Voters of Boston and Massachusetts and the University of Massachusetts Boston School for the Environment. — Congressman Neal’s Berkshire County Town Hall. This is a very important opportunity to engage with Rep. Neal, the ranking member on the House Ways & Means Committee. Got questions about energy & climate? Environmental Justice? Holding the line against the changes this administration wants to make? Here’s the chance to ask! — Renewable Portfolio Standard – Bill Hearing! The Joint Committee on Telecommuni-cations, Utilities and Energy (TUE) will hold a hearing on bills related to the Renewable Portfolio Standard. The RPS is a critical tool for advancing clean energy. Come show your support! Mass Power Forward supports increasing the Renewable Portfolio Standard by 3% each year, driving demand for renewable power and growing our local clean energy industries. We also support a statewide solar target of 25% solar by 2030. Additionally, we support a proposal by Rep. Khan to accelerate the RPS by 2% per year while incorporating municipal light plants into the state’s clean energy goals. — SHARE Press Conference Calling for a Renewable Alternative to a Fracked Gas Power Plant. Governor. Cuomo proposes a new fracked gas power plant for Sheridan Hollow in Albany. Climate activists call for a renewable energy solution. This past May, Governor Cuomo announced plans to construct a new 16 megawatt fracked gas power plant in the center of Albany*, just blocks from the Hampton Inn Hotel in the community called Sheridan Hollow. The new Sheridan Hollow Power Plant would be built in the old ANSWERS plant, (a trash to energy plant that was closed in 1994) and would provide power and heat to the Empire State Plaza, the Capitol and other government buildings. It would power a microgrid that could operate independently of the power grid. $89 million has already been approved in the New York budget to fund the microgrid and a Request for Proposals (RFP) was issued in July. An announcement of who will be awarded the contract is expected sometime this fall. 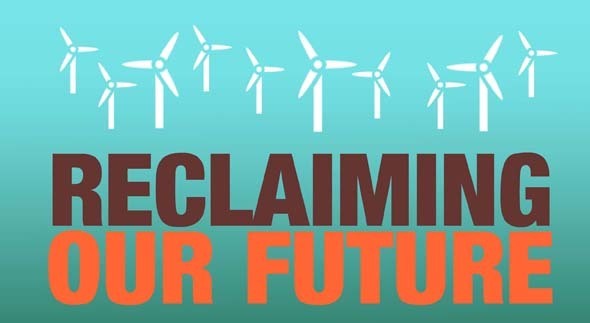 A newly formed coalition named Sheridan Hollow Alliance for Renewable Energy (SHARE) includes neighborhood groups, SNYFGP, PAUSE, Food and Water Watch, Citizen Action, Catskill Mountainkeeper. Join Sheridan Hollow Alliance for Renewable Energy (SHARE) on the third floor of the capitol for a press conference about our call for a renewable alternative to the fracked gas power plant. — FERC Protest in D.C. We need a big showing at FERC’s September 20 meeting! We’ll have a rally before the meeting begins and then we’ll be inside the meeting, in overflow rooms, outside chanting, and some of us will even go to Capitol Hill to lobby. We’ll be chanting, disrupting, showing solidarity, lobbying. Here’s why! — FERC is set to reconvene on September 20th with Trump’s Senate-approved commissioners Robert Powelson and Neil Chatterjee eager to use their newly minted rubber stamps. Lobbying on the Hill – Meetings being scheduled – Be sure to indicate that you’re interested in lobbying on the sign-up form. » Be sure to share the Facebook event page! — Non Violent Direct Action Training. NVDA is essential to movement building. It provides a basic foundation about the tenets and history of non-violence, the range of non-violent direct action, including the possibility of civil disobedience (risking arrest), community building, understanding the legal process, democratic decision-making using consensus, the use of affinity groups for mutual support and safety, and, reflections on whether to engage in civil disobedience/risking arrest. — Learn About Ceremonial Stone Landscapes. Doug Harris, Deputy Historic Preservation Officer for the Narragansett Indian Tribe, will be speaking on Ceremonial Stone Landscapes, his fight to preserve them and his legal challenge to FERC. He will have information about the legal challenge to FERC to protect the ceremonial stone landscape from pipelines both days at a table in the Climate tent. — What is Carbon Pricing? Presentation by Mary Jo Maffei and Mark Hart. Have you been wondering what Carbon Pricing is or what a Carbon Pollution Fee and Rebate would be? It is a broad, market-based initiative critical to lowering carbon emissions. Virtually all economists support this approach and it has been successfully implemented around the world. Massachusetts currently has two bills in the State House (S1821 and H1726) that would put a fee on carbon pollution. MA legislation is particularly important because it can become a model for other states and our country. A coalition of groups is working to pass these bills. This presentation will include ways that you can help pass this essential legislation! — State Divestment Bill Hearing. The bill to divest the Massachusetts Pension Fund from fossil fuels (H.3281) has a hearing before the Public Services Committee. The MassDivest Coalition, of which 350 Mass is an endorsing member, needs activists to attend! All are invited to gather at 11 am in the 4th floor coffee shop to lobby beforehand. — Wetlands Permit Court Date. The Town of Weymouth and Spectra will be in court over the Town’s denial of the Wetlands permit. The public is welcome, but a few housekeeping details: appropriate “court” attire, no signs, no protesting and if you do not want to leave your cellphone with the court officer, leave it in your car. — Go Renewable! Energy Panel. Each presenter will speak about a different aspect of renewable energy, followed by a Q&A session. Free & open to the public. All are welcome! — Illegal Subdivision Court Date. The Town of Weymouth and Spectra will be in court at 2:00 at Norfolk Superior Court in Dedham over Calpine’s sale of illegally subdivided land to Spectra. The public is welcome, but with the same rules as above. — Care For Common Home Environmental Forum & Shalefield Stories. Inspired by Pope Francis’ Laudato Si to bring our community together in solidarity to educate and take action. Keynote speakers, breakout sessions, and exhibitors will address local, regional, national, and international aspects of climate change and sustainable development. Debut of “Shalefield Stories” traveling photography exhibit and “Prayers from the Earth”. — Stop the Pipeline Awareness Vigil against National Grid’s Back Bay Pipeline. 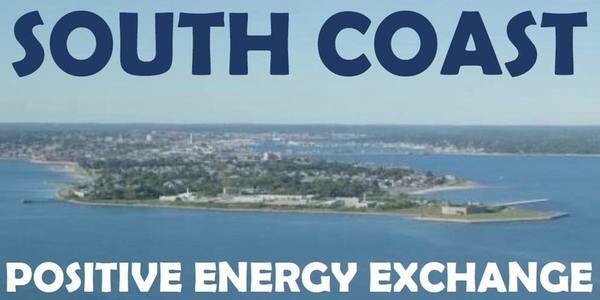 From Boston Clean Energy Coalition: “Hello friends – your help is needed. National Grid is planning to construct a new fracked gas pipeline that will snake it’s way through the downtown (Back Bay and South End) are. They have introduced the matter before the Public Improvement Commission (PIC). Please join a vigil to protest this project and educate the public. Wear green T-shirts. Corner of Dartmouth and Boylston St.
— D.C. Court Support: People vs FERC to #StopSpectra. Field trip! WE NEED YOU to be a supportive community in Washington DC! The case our partners SAPE (Stop the Algonquin Pipeline Expansion) have been leading since day one is going to court. Allies from NY to MA, including the City of Boston and Town of Dedham are having their day in court to challenge FERC’s approval of the AIM Pipeilne. Join members of Resist Spectra, SAPE, West Roxbury Saves Energy, Sane Energy Project, Food & Water Watch, and many more to be a dignified citizen concerned about health and safety in the public courtroom. — Fall Fest in the Park. FRRACS will be hosting a Fall Fest in the Unnamed Park that surrounds the proposed compressor site at 6 Bridge Street in Weymouth. We will have music, face painting, pumpkin painting, silent auction, yoga in the park, information tables, a park naming contest, speakers, and a community meal of soup, bread, and cookies. We want to celebrate the park that Spectra intends to take away from our community! For more information go to http://www.nocompressor.com. If you would like to volunteer, we could use your help! Reply to this email or come to the meeting on Tuesday and sign up. If rain is predicted, we will call off the Fest no later than noon on Friday Oct. 20th and reschedule for the spring–so please stay tuned. — Climate Action Now Monthly Gathering – Featuring focus on Community Solar Power with Malcolm Bliss from Co-op Power and the #StandUpCharlie Campaign with Cathy Kristofferson from Stop NED & Alan Palm, New Director of Organizing with 350 Mass for a Better Future. – Presentation by Dr. Curt Nordgaard. 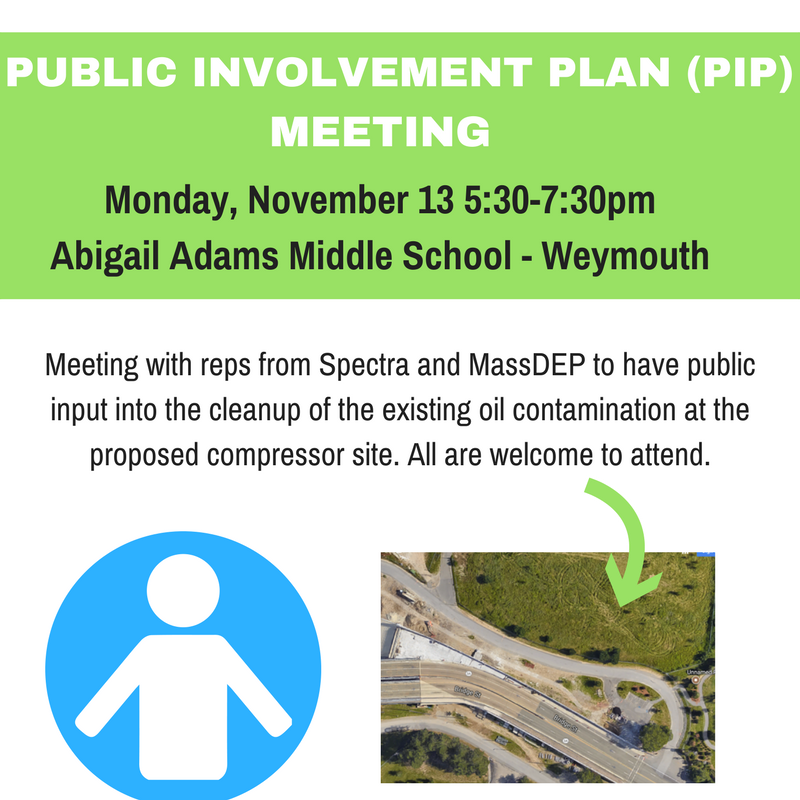 Air pollution and the proposed Weymouth compressor station: What was left out of the draft air pollution permit? 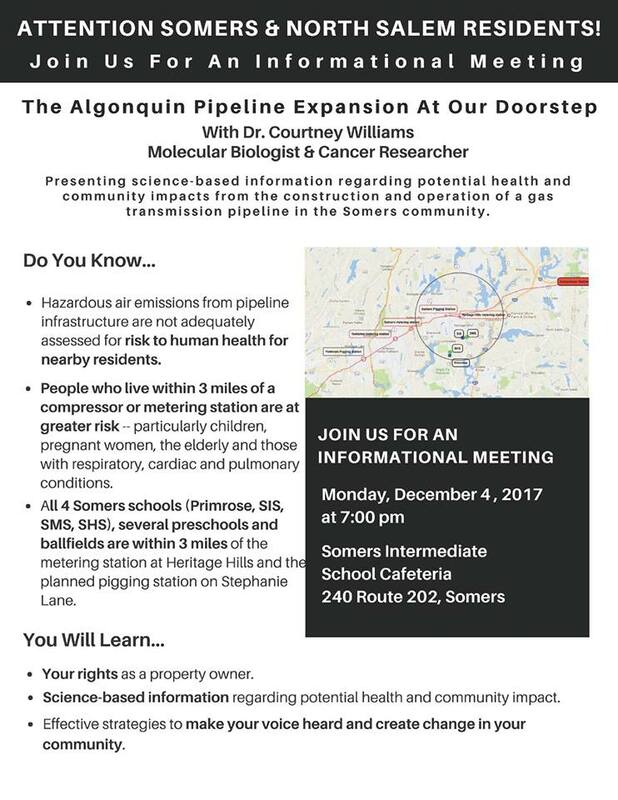 FRRACS will present air pollution modeling data relating to blowdowns (releases of natural gas) from the compressor station. A short presentation will be followed by discussion of the modeling technique, results, and next steps. All are welcome to attend. The presentation will be directed to the potentially affected communities in Quincy, Weymouth and Braintree, as well as other South Shore residents who use Rt 3A and the Fore River Bridge. — Divestment Prayer Action. Meet at Pulaski Park near the Academy of Music in Northampton. Walk to TD Bank on Main Street. A Divestment Statement will be read and delivered to the bank manager. Some people may walk into the lobby for prayer and song. Copies of the statement will be distributed to the public. — Rally at Eversource Office. Join CT Sierra Club, 350 CT, Consumers for Sensible Energy and other allies at this protest, and help us amplify the message to the public, the media, state leadership, Eversource and Avangrid that duplicitous utility company practices hurt consumers, raise energy prices and invalidate the need for public investment in expanded fracked gas infrastructure. Increased fracked gas pipelines ARE NOT NEEDED. We have said for years that the pipelines are not operating at capacity and this new EDF study confirms that. — Free Showing of “An Inconvenient Sequel” by Al Gore. Join us for a screening event of An Inconvenient Sequel: Truth to Power, the recently released follow-up to the Oscar-winning An Inconvenient Truth. Afterwards join organizations across the country at 6:45 for a live-streamed Q&A private webcast with Al Gore. The webcast will only be accessible to event. Free and open to all – registration requested. Contact the library, www.longmeadowlibrary. 413-565-4181. — Protecting the Water: Stories from the Road. From Standing Rock to Otis State Forest, Rhonda Anderson; From Plymouth Rock to Standing Rock by Bicycle, David Detmold; Songs from Standing Rock, Annie Hassett. Co-sponsored by Nolumbeka Project and the Social Justice Committee of All Souls Church. — Protest at Tennessee Gas Pipeline: Agawam, organized by March Hares Affinity Group. The action will be in conjunction with Six Flags Fright Night and present a scary scenario if we continue on the path of fossil fuel use. Bring banners and signs linking Native American prophecy, black snake, with pipelines and destruction of the earth. “Mini Winconi” and other signs of solidarity. — WATER Prayer Service. Right now, Otis State Forest is suffering the wrath of an ignorant corporation who’s agenda is profits over the planet, the people, and everything dependent on clean water to survive. The pipeline is reportedly 95% complete. Come pray for the water. Bring Your Family and Friends. We are asking that all Pipe carriers/ Staff carriers, Drummers/ and Singers come and pray with us. Town Hall with Senator Markey. Senator Ed Markey will host a Town Hall in Pittsfield next Sunday, October 29th. He wants to be sure that all those who have a particular interest in the environment are invited. — Benefit Concert: Protecting Indigenous Sacred Stone Sites. A benefit concert to raise funds for the protection of Indigenous sacred stone landscapes. The forests of New England are dotted with Ceremonial Stone Landscapes, living prayers of stone created by the Indigenous peoples of this region. The traditional belief is that these stone structures were placed to create and restore harmony between human beings and Mother Earth. The prayers they embody continue to live as long as the stone landscapes are kept intact. For more information or to make online contributions, go to https://tinyurl.com/protectsacredstones. — Transportation Sector Emissions Listening Session. Sessions across the Commonwealth to discuss solutions to the challenge of reducing greenhouse gas emissions from the transportation sector, hosted by the Executive Office of Energy and Environmental Affairs (EEA) and the Massachusetts Department of Transportation (MassDOT). These listening sessions highlight the collaborative approach the Baker-Polito Administration is taking to work across state government and with our cities and towns to reduce emissions and prepare for the impacts of climate change. • Address environmental justice, low income and rural communities. — Clean energy tour of the town of Kingston, MA. Have you ever noticed the wind turbines visible from Route 3? You’ll have a chance to see them up close at our Kingston clean energy tour! Kingston has a renewable energy grant program, wind turbines on their capped landfill, and has increased its recycling rates after having one of the lowest on the South Shore. We will meet at the Kingston train station at 10 am. – Finally, an optional lunch at the Charlie Horse Restaurant which boasts on-site solar, composting, and locally sourced food. Ready to be inspired about actions your own town might be able to take to be more green? Learn from your peer’s experience with our Kingston clean energy tour. We encourage you to take the commuter rail to reduce your carbon footprint. A train arrives at 10 am in Kingston from South Station. We’d like to ask hose who will be driving in to volunteer to carpool with anyone who needs a ride when getting around Kingston for the tour. Monday, November 6 marks the opening of the United Nations Climate Conference in Bonn, Germany. The Trump Administration has withdrawn the United States from participation in the agreement signed by the US in Paris in November 2015. In the face of Federal Government climate denial, the Reclaiming Our Future events call on Governor Charlie Baker to honor his pledge to uphold the Climate Alliance agreement here in Massachusetts, despite Trump’s withdrawal. Make our state a leader in cutting emissions. Please join us for three events! LEAD SPONSORS of the Reclaiming Our Future actions: Climate Action Now, Arise for Social Justice, and Springfield Climate Justice Coalition. We are joined by well over 30 co-sponsoring organizations. — Vigil for Climate Action. 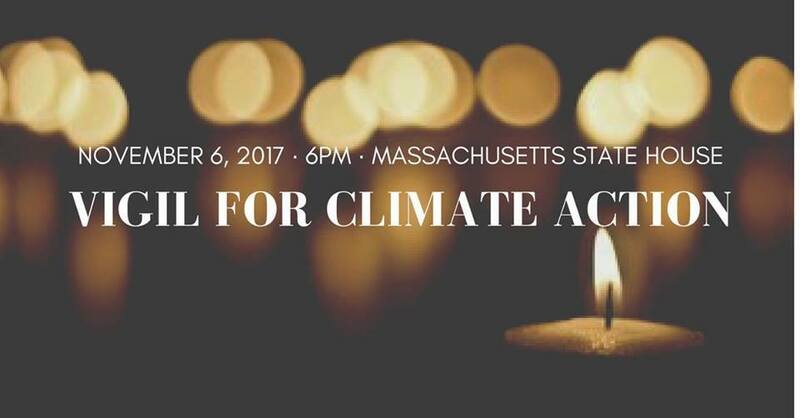 After weeks of standing in the Governor’s office asking that he issue an executive order halting the development of fossil fuel infrastructure in the Commonwealth, on Monday, November 6 from 6-7pm we will come together as a coalition of leaders and organizations of faith and of non-faith in a candlelight vigil on the Statehouse steps. This will be the opening day of the UN Climate Change Conference in Bonn, Germany (COP 23), and we will stand as people of hope that Massachusetts might take the lead on climate, even when our country will not. As we consider the intersections of climate justice, we will hear from local leaders of the movement, gather together in moments of silence, song, and hope, and pray for our leaders here in Massachusetts and abroad. You are welcome to bring organizational signs and banners, but because this is a vigil, we do not recommend protest signs. Hosted by Mass Power Forward and others. — Documentary film Black Snake Killaz: a #NoDAPL Story. The film was produced by our friends at Unicorn Riot who were on the frontlines at Standing Rock from the beginning. This is the premier documentary about the #NoDAPL movement. Please take a moment to register to attend a screening. You can also check out the trailer for the film (content warning: police violence). There will be a suggested donation of $5-$15 for attending a screening. But no one will be turned away due to lack of funds. Money raised will be split between Unicorn Riot and a new bail fund that FANG is establishing to support people who are arrested as part of direct actions. — Discussion of campaign to protect Ceremonial Stone Landscapes. Doug Harris, Narragansett Indian Tribal Historic Preservation Officer, and Attorney Anne Marie Garti will discuss Protecting the Indigenous Ceremonial Stone Landscape. — Stop Canal 3: No Fracked Sandwich! It is well past time to stop spending our money to build new infrastructure for fossil fuel projects! Especially when the project’s profits go to a Texas-based energy behemoth. Come voice your concern at the site of a new gas-fired generator proposed for the Cape’s Canal Plant. This generator will lock the Cape into another 30+ years of old technology, rather than moving on to a clean future of renewable energy. We’ll be kicking the day off with a fun-filled performance, followed by speakers from 350 Mass Cape Cod, Conservation Law Foundation and Sierra Club. Together, we are mighty so let’s come together to build a better future. — Legal Observer Training. Legal Observers assist at protests, rallies, and other events to document and be a witness to any occurrences. Legal Observers are trained periodically throughout the year and upon requests from organizations for specific events. National Lawyers Guild (NLG) Legal Observers, often in neon green hats and apparel, are deployed to rallies and protests on behalf of political protesters committing acts of civil disobedience, to observe should arrests occur. Join this training to become an official NLG Legal Observer! No previous legal experience is required. The training will be facilitated by the Rhode Island Chapter of the NLG. — Rally in Albany – OFF Oil & Gas, ON to Renewable Heat Now! Join Alliance for a Green Economy and the other members of the Renewable Heat Now campaign for a very important rally and press conference in Albany to call for the state to get off oil and gas and ramp up the conversion to renewable heating and cooling. 38% of New York’s greenhouse gas emissions currently come from heating and cooling our buildings. We must switch from fossil fuels to renewable heating and cooling technologies in order to combat climate change and reach renewable energy goals in New York. Efficient electric heat pumps (ground source (geothermal) and cold-climate air source) can efficiently heat and cool our homes and eliminate the burning of fossil fuels. We must let New York decision makers know the time is now to get off oil and gas and make the change to renewable heating and cooling for all of New York! » Join a Carpool from Across the State! » Get on the Bus from NYC, Croton and New Paltz! — Public Improvement Commission (PIC) hearing. PIC intends to grant permits to National Grid to begin construction of this 1.1 mile ‘gas main extension’, despite the fact that they had seemingly promised advocates that they would wait until NGrid had held a series of public meetings. Supposedly the PIC will not allow NGrid to begin work until these meetings have taken place, but those opposing take the position that the meetings are a sham if our public input has no impact on the outcome. Needless to say, the Boston Clean Energy Coalition is opposed to a major project that will increase the use of fracked gas in the city, and we are doing all we can to get that message out. Please see the Facebook event page, and visit Boston Clean Energy Coalition website to get on the mailing list. — Social Media for Actions and Demonstrations. This workshop will focus on how to use social media to cover actions, demonstrations and for pressure campaigns. We will discus best practices for preparing media before an action, carrying out social media during an action and then using social media to maintain campaign narratives. Specific topics will include how to organize a social media storm, using Facebook live and security culture for social media. Over the past four years FANG has coordinated social media for dozens of direct actions and mobilizations. This workshop will be based on these experiences. But we also look forward to having group conversations about other social media tactics that can be utilized. — Hearing on net zero carbon buildings. Please plan to attend this event as well, shake your networks, spread the word. We as climate justice activists need to become much more educated in addressing the built environment. We see this hearing as a start. Please join this effort in any way that you can. — Nonviolent Direct Action Training. This workshop offers an introduction to the history of nonviolent direct action and its implementation as well as examples of intersectionality within our community/movements, affinity groups and their formation, consensus decision making, and a discussion on self-care and community care. This workshop is meant to help prepare people to participate in actions, plan their own actions or just to have a deeper understanding of direct action. — EFSB Hearing and Open Meeting. A Public Hearing and Open Meeting have both been scheduled by the EFSB for this Tuesday to discuss a number of important issues including; multiple motions filed, Contingent Water Supply Plan, and Invenergy’s Dec. 1 letter regarding FERC, Invenergy, NGrid and ISO-NE. Here are the official details of the two different meetings on the same day. – The Town of Burrillville filed a Motion Seeking an Order of the EFSB Requiring an Independent Environmental Impact Document and Appointing an Independent Environmental Expert to Evaluate the Adverse Environmental Impacts of Invenergy’s Proposed Power Plant. – Invenergy filed a Motion for Protective Treatment of Confidential Information contained in an attachment to the Supplemental Testimony of John Niland. – The Town of Charlestown filed a Motion for Clarification/Instructions and/or for an Extension. – The Town of Charlestown filed a Motion for Funding as an Affected Community.The Rhode Island Energy Facility Siting Board will conduct an Open Meeting at 10:30 AM following the Hearing. — Green Night: HeatSmart Northampton – A Community Program Bringing Efficient Heat Pumps to Homes. Join Chris Mason, Northampton’s Energy & Sustainability Officer, for a conversation on ways to increase the market share of cold climate air source heat pumps and other renewable thermal technologies. Grist for the conversation will include: a report by Chris on Northampton’s HeatSmart program (a Solarize-type program for air source heat pumps) that is running from September 2017 to the end of January 2018; and an overview of Northampton’s work to use public information on Northampton’s residential building stock and infrared scans of Northampton’s single family homes to identify micro-target messages to promote clean energy and energy efficient home improvements. — Movie: The Age of Consequences. Through the lens of national security and global stability, a look at the impacts of climate change on increased resource scarcity and migration. As part of a case-study analysis, admirals, generals and military veterans take viewers beyond the headlines of the conflict in Syria, the social unrest of the Arab Spring, the rise of groups like ISIS, and the European refugee crisis — and lay bare how climate change stressors interact with societal tensions, sparking conflict. 350 MA-Berkshires will be co-facilitating this film and Alvin Blake of 350 MA will participate in leading the discussion. — DPU Hearing – National Grid petition for special financing deal. Come support the testimony of BCEC and NABB before the Department of Public Utilities. National Grid is looking to lock in luxury high rise developers to pay for their pipeline expansion project in the Back Bay and South End, and they want to keep the details a secret. Fortunately the AG is looking into this arrangement. We would like to show the DPU their is opposition; your presence will help.